Nancy did not join us on this night dive in the Lembeh Strait. During the pre-dive briefing, the divemaster told us we might find a stargazer (among other things). When I finally saw the fish in real life, I was very cautious around it — but I still moved in close as I dared for a good shot. The fish didn’t move. Not even the eyes; nothing. It really did look like a mask. A really, really, REALLY ugly mask. 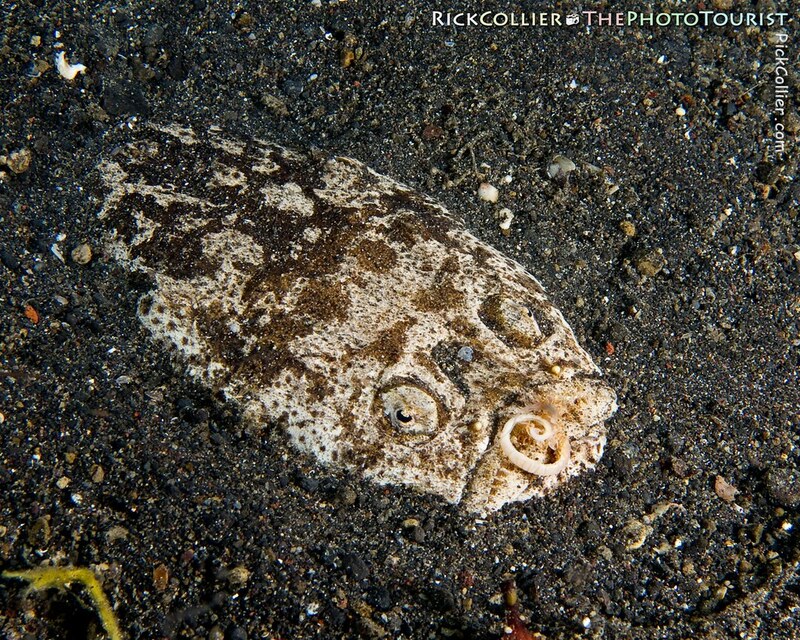 To be honest, the stargazer is just about the only critter found in the Lembeh Strait that I really never had much interest in seeing. The pictures I’d seen before were enough; this thing has not even the smallest scintilla of attractiveness. 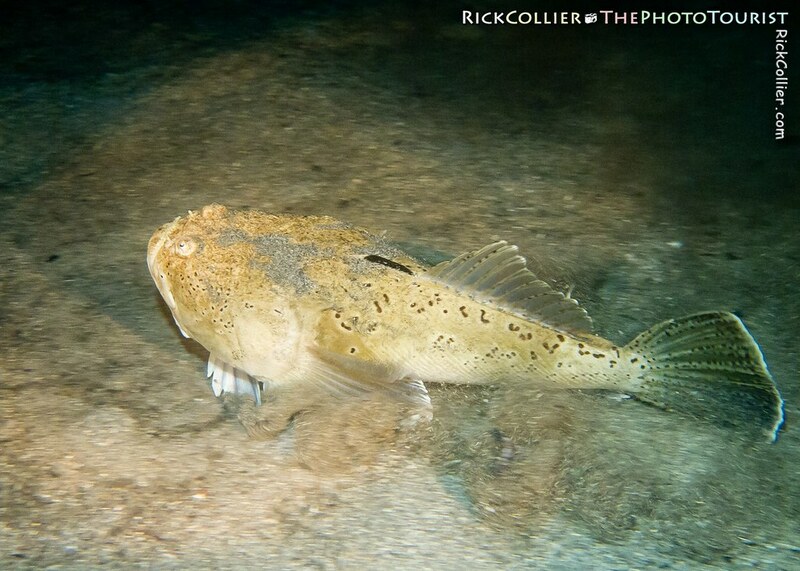 Also, there are spikes in its fins (like a stonefish), it has a long tongue (the better to strike with), and it’s capable of generating an electric charge if threatened. So it’s ugly AND nasty. It’s ironic that someone attached the somewhat whimsical name “stargazer” to a fish that is so … well, definitely not whimsical. Yet, there I was, at about 60 feet looking at one. Taking its picture. As I finished my portraiture, I floated up (away from that ugly thing) and saw the divemaster herding a small fish from sandy depression to depression along the bottom, moving toward the stargazer. Eeew. The little fish arrived in the stargazer’s little sand depression and tried to hunker down at the bottom — just like it had done in each little depression along the way. We waited briefly; I triggered my camera when something happened. A sudden commotion, a puff of sand stirred up, something light shot up in the water, and the little fish was gone. The stargazer seemed not to have moved. Our divemaster giggled loudly. Underwater. Which made the whole thing just a little creepier. Looking at the pictures later, I found that I missed almost all of the stargazer’s strike. But I did get a picture before he’d managed pull his long tongue all the way back into his mouth. In another night dive about a week later, diving in Bunaken (on the opposite side of North Sulawesi from the Lembeh Strait), my divemaster and I startled a stargazer that apparently was insecure about his sandy hiding place. He suddenly emerged from the sand, moved over a few feet, and quickly re-buried himself. It is not very usual to see a stargazer actually out and swimming around the bottom. I was startled, but snapped a quick photo by reflex. This entry was posted on Wednesday, February 2nd, 2011 at 16:48 PM. 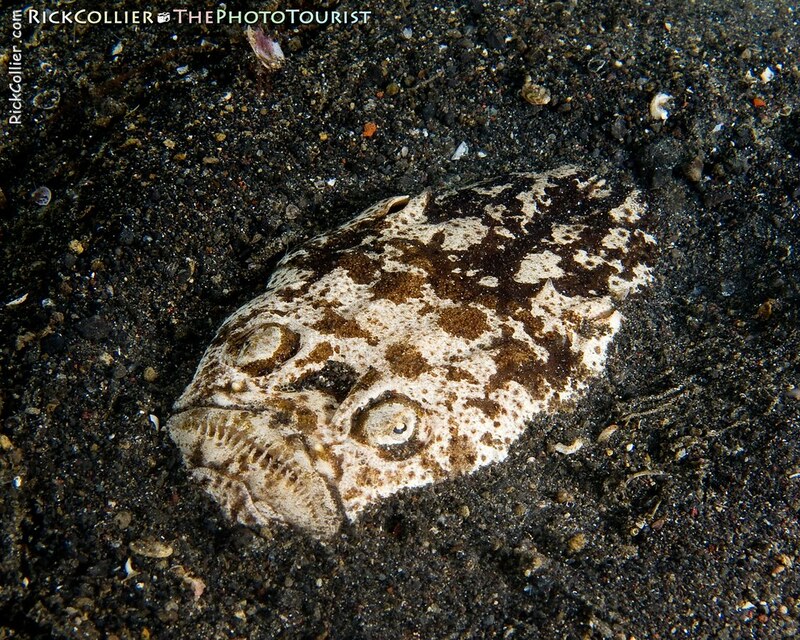 It is filed under thePhotoTourist, Underwater and tagged with bottom, death mask, diving, face, feeding, fish, Indonesia, Lembeh, Lembeh Resort, Lembeh Strait, mask, night, night dive, North Sulawesi, predator, sand, sandy bottom, scuba, scuba diving, star gazer, stargazer, Sulawesi, ugly, Underwater. You can follow any responses to this entry through the RSS 2.0 feed.